As Kara investigates a series of Cadmus-backed alien kidnappings, Alex continues the hunt for Jeremiah Danvers and Lillian Luthor. 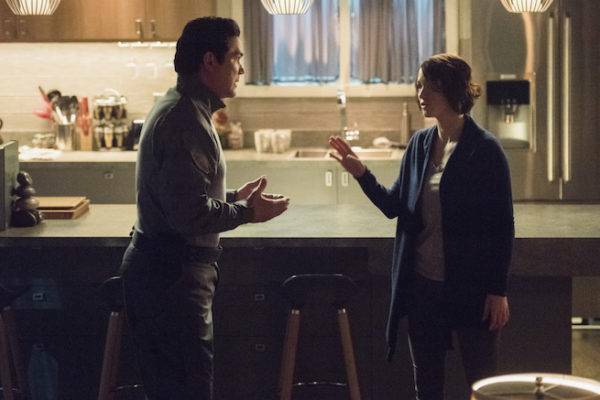 When Kara's editor refuses to run a story on the abductions based only on Supergirl's word and Alex is suspended due to J'onn questioning her ability to remain impartial, it becomes apparent that the two sisters will have to break some rules to stop Cadmus' latest plot. Granting that it is topical, Alex's "you are forcibly deporting these people" line comes off as a little forced. Not a goof on the show but a goof on the social media team - danvers.com appears to be available. How could they not have snatched that up to start making some AR content for the show by showing us Kara's "real" blog? This episode is a triumph for Chyler Leigh on every level. The opening sequence with the family being abducted is well-directed and jarringly different enough from the usual tone of Supergirl that it effectively grips the viewer right away. The fight sequence when Cadmus attacks the alien bar features some fantastic choreography and wonderful cinematography. The entire scene of Supergirl stopping the frigate from launching is well-shot and has some great music underscoring the mostly dialogue-free scene. The episode title comes from the technical term for a mass departure of immigrants. It is also the name of the second book of The Hebrew Torah and The Christian Bible. Mon-El makes a reference to Zakkarian Ale. In the Green Lantern comics, Zakkaria was a planet in Space Sector 2814 (the same one as Earth) which was the home world of a criminal known as Izar The Zakkarian. Izar led an intergalactic criminal gang known as The Crimson Star Mob, with whom the Green Lantern Kyle Rayner came into conflict. Zakarian (with one K) also appears to be the name of a now defunct brand of beers and ales. Lillian Luthor quotes from Thus Spoke Zarathrusta by Friedrich Nietzsche - the novel in which Nietzsche outlined his concept of a over-man (or super-man) who represents the eternal struggle for self-mastery. Nietzsche also spoke against idealization in any form and urged people to improve this world rather than waiting for some perfect afterlife. At one point, Lilian says to Jeremiah "This time you are the only Superman we need." This is a nod to the fact that Jeremiah's actor - Dean Cain - played Clark Kent and Superman in the TV series Lois And Clark. IMDB names the Cadmus agent who is disguised as a cop as Shuster. This is a nod to Joe Shuster - the artist who co-created Superman. The actor who plays Shuster - Dean Redman - is also the voice of Nick Fury in various Marvel Comics animated films. Jeremiah Danvers describes the ship being used for Project Exodus as a Hoshin Frigate. Hoshin is a Japanese word meaning "setting a direction" or "setting an objective." It is revealed that the goal of Project Exodus to deliver the aliens to a world called Takron-Galtos. First appearing in a Legion of Super-Heroes story in Adventure Comics #359 (August 1967), Takron-Galtos is the chief prison planet utilized by The United Planets and The Legion Of Super-Heroes in the 30th Century. The world is also a prison planet some 1000 years earlier, having been utilized by both The Green Lantern Corps and the bounty hunter Lobo. In the final scene, the hooded alien woman is played by Teri Hatcher. In addition to appearing on Desperate Housewives with Lillian Luthor actor Brenda Strong, she played Lois Lane on the TV Series Lois and Clark. In the final scene, the hooded alien man is played by Kevin Sorbo. A veteran actor famous for his appearances in various science-fiction and Christian-themed productions, he is still best known to a generation of fantasy fans as Hercules in the 1995 Hercules: The Legendary Journeys television series. The captured Cadmus agent has some means of negating Martian telepathy. He claims he also has something in his head that will alert Cadmus if he gives the DEO any information and kill him instantly. There is a magnetic field disruptor in the DEO armory which J'onn (disguised as Jeremiah Danvers) says he can use to disable the death-trap cages Lillian Luthor has set-up in Cadmus. We're told that the ship being used for Project Exodus is a Hoshin Frigate - the best in the Kazark fleet. It can travel at light-speed and it is set to travel to Takron-Galtos. Alex planted 10 Haldorr particle mines all over the Cadmus base before she was caught. Half of them are set on a dead-man switch to rigged to explode once released. J'onn: Are we any closer to finding out where Cadmus is taking them? Mon-El: Or what they want? 'Cause hat's the trillion-dollar question. Winn: It's million-dollar question, buddy. Mon-El: Hey, uh (clears throat) Winn, you know what you need right now? Mon-El: Oh! I was going to say a deep breath! But that is a much better idea! Jeremiah: Will you help me or not? Alex: J'onn... you were testing me? J'onn: I had no choice. You're a federal agent, Alex. You took an oath. We're facing a crisis situation here. Thousands of lives are at stake. I feared your judgement might be compromised. Sadly, I was right. Lillian: "The over-man shall be the meaning of the earth. Remain faithful to the earth, and do not believe those who speak to you of otherworldly hopes." Lillian: Who better? His Super-Man was about we humans believing in ourselves instead of looking up to gods. This time... you're the only Superman we need. Alex: Turn it off! Now! Lillian: You don't threaten me. Alex: Lillian, do you really think I'd walk into the lion's den without a whip? I planted 10 Haldoor Particle Mines all over this facility. (holds up a trigger) Stop the launch! Alex: The rest of the bombs are on a dead-man switch! I let this go and the entire place lights up! Lillian: I won't stop this. Alex: I don't need you to. (looking to Jeremiah) Dad? It's time for you to do what you told your daughters to do. Are you with me? Lillian: Tamper with my launch, Jeremiah, and I declare war on your whole family. Alex: If you let her... We're going to protect each other. Always. Alex: Dad... make this right. J'onn: Please know... I only did it to protect you. I didn't mean to hurt you. Alex: You sound just like him. Alex: Can we just agree to stop doing the wrong things for the right reasons? J'onn: Yeah. That sounds like a plan. Jeremiah: Lilian was going to kill them all! Jeremiah: At least this way they have a chance. Winn and Lyra both enjoy the film version of Dune, despite how the sandworms were handled. Lyra has been living on Earth for several years, but she learned English off-world. Cadmus has devised some means of protecting all their agents from Martian telepathy - not just Jeremiah Danvers. Lena suggests that Kara consider becoming a blogger rather than working for CatCo. She also volunteers to check L-Corp's records for any business dealings that might lead to Cadmus or any technology that might help locate the missing aliens. Lena discovers that a LuthorCorp naval research facility was closed in 2007 yet L-Corp was billed for a metal shipment to that facility in 2017. Lillian has a spy in L-Corp reporting to her on her daughter's activities. Jeremiah explains that his plan was to forcibly deport all the abducted aliens off-planet. He considered this preferable to Lillian Luthor's plans to just kill them all. He also says the only reason he worked for Cadmus was because they threatened his daughters. Jeremiah is shot by Cyborg Superman's eye laser. It is unclear if he survived the blast. Kara is fired from CatCo for publishing an article utilizing CatCo resources on a rival platform and for working for another media outlet in violation of her contract. In the final scene of the episode, the hooded aliens last seen in 209 are revealed as a man and woman, who are addressed as Your Highnesses. The man comments, upon standing in a yellow sunbeam, that there is something different about "this place" and the woman comments that she feels different. An unnamed freeway, presumably somewhere outside of National City. There were 19 abductions of aliens on Earth before the scene that opens the episode. After two episode of being completely absent, it's somehow even more jarring for James Olsen to show up just to comment on Winn's new girlfriend and briefly appear as The Guardian to help the DEO catch a Cadmus agent. As much as I love Mehcad Brooks, I almost wish the show would just let his character go at this point or that he'd be brought on as a full-time DEO agent because it's clear that the writers have no idea what to do with the character at this point. A solid episode that is most notable for what it lacks rather than what it contains and how much of Kara's subplot is devoted to streamlining the show as Alex takes center stage. It's not a great ensemble piece (I think Winn's girlfriend has more lines than James Olsen at this point.) but it does a great job of advancing darn near every subplot in the series that was in need of some momentum.